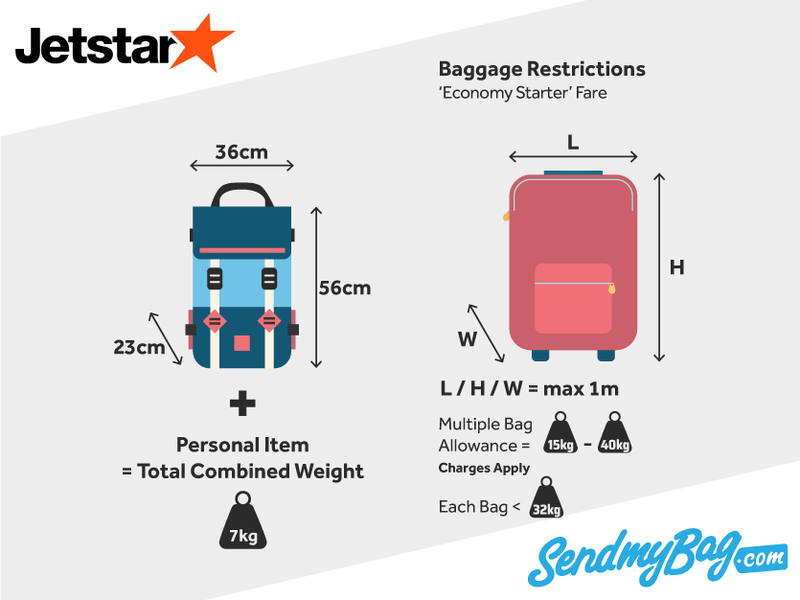 What are Jetstar's baggage size restrictions? What fees do Jetstar charge? Read on to find out. Instead of paying to check your bags with Jetstar you could use that money to ship your luggage to your destination with Send My Bag and thereby give yourself the luxury of a luggage-free journey. You can send much more luggage than you can check into the hold, too. Find out here how cost effective it is to send your luggage, especially if you are moving abroad or going on a long trip. Economy Starter, Starter Plus and Starter Max: one larger carry-on item, 56 x 36 x 23 cm, plus one smaller item. The total weight of these two items must not be greater than 7 kg. This weight allowance increases to 10 kg for Flexibiz passengers. Business Class passengers are allowed to bring two larger items of carry-on luggage, as long as each item does not exceed 7 kg individually, plus a small item. The combined weight of all carry-on items should not exceed 14 kg. The smaller item of hand luggage might be a handbag, umbrella or coat. On regional New Zealand flights operated by the smaller Q300 aircraft, the dimensions of your carry-on bag must not be larger than 48 cm x 34 cm x 23 cm. If travelling on a Q300 flight and your item is larger than these dimensions but still within the standard dimensions permitted by JetStar’s baggage allowance, your item will be checked free of charge. What if my Jetstar Carry on is Overweight/Oversized? If, however, an item exceeds JetStar’s cabin baggage allowance, your item must be checked, and you will have to pay a fee. On domestic Australia and New Zealand flights, the fee is $60 AUD (or $60 NZD) for up to 15 kg. On international flights to and from Australia the charge is $100 AUD for up to 15 kg. Small instruments under 7 kg and measuring no more than 85 x 36 x 23 cm may be brought on board as carry-on luggage. A larger instrument weighing no more than 15 kg can be brought on board if an extra seat is purchased for it. It must have a handle so that it can be strapped securely into the seat. Economy Starter: no free baggage allowance. Economy Starter Plus: 20 kg. Economy Starter Max and Business: 30 kg. Passengers may check as many bags as they like, as long as they don't exceed the weight allowance. No single checked bag may weigh over 32 kg. Adults travelling with young children may also bring a stroller, cot, car seat or portable high chair at no extra cost. If you bring luggage to the airport without pre-purchasing a baggage allowance for it, you will be charged for the first 15 kg per passenger and then for every additional kilo after that. The fee for the first 15 kg is $60 AUD on domestic flights and $100 on international flights to/from Australia. The cost per additional kilo is $15 AUD for domestic flights and $25 for international flights. Connecting flights with a domestic and international leg will be charged at the international rate. If you purchase a checked baggage allowance before you come to the airport but arrive with more than you paid for, you will be charged per extra kilo, as above. Note that items with one side longer than 1m will be considered an oversized item and an oversized handling fee of $25 AUD per item, one way, will apply. Infants not occupying a seat are not entitled to a checked baggage allowance, but you can check a pram/stroller, a portable cot, a highchair and a car seat/ booster seat/ baby capsule, free of charge. According to JetStar’s baggage allowance rules, any sporting equipment that has a side over 1 m in length will incur an oversized handling fee of $25 AUD per item, one way. Smaller musical instruments can be brought into the cabin with you. An extra seat must be purchased for instruments weighing between 7 kg and 15 kg. Instruments over 15 kg must be checked. Note that there are restrictions on the number of larger instruments that can be carried on one flight. Looking for Jetstar sized hand luggage?